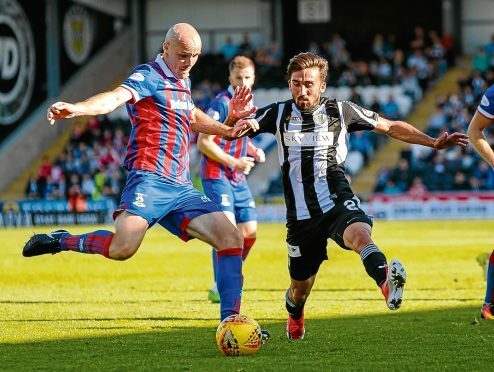 David Raven is certain Caley Thistle will be right in the thick of the promotion race come the final weeks of the season. The only sadness for the Liverpudlian right back is the knowledge he is highly unlikely to be part of it. Raven, a Terry Butcher signing in summer 2012, has put in a power of good work for John Robertson’s side this season despite being told in the summer he was free to find a new club. Cost-cutting measures after last season’s relegation had Raven on a list of higher earners deemed surplus to requirements. It was a familiar rejection for the dependable, gritty former Liverpool, Tranmere Rovers and England under-20s defender, having previously fallen in and out of favour under Butcher’s successors John Hughes and Richie Foran. With his contract set to expire after Christmas, Raven expects to leave in January and is full of disappointment at having to leave a squad now producing results and forging a great team spirit. Uprooting his family from their settled Highland base is another source of deep regret for a player who has shown unflinching professionalism despite his situation. Preparing for tonight’s rearranged home Championship tussle with Brechin City, Raven said: “Despite the setback at the weekend, where we felt very harshly done by, we’re not far away from the promotion chase. “I believe that we can get ourselves up there right among it. We need to keep the squad together and add one or two but I believe there’s nothing in the league to stop us. It is understood Inverness have offered Raven a greatly reduced contract extension but he stressed: “It’s not a money issue for me at all. There are a lot of different factors I’m taking into account. “I’ve been in this situation season after season and it becomes tiresome. I have to look at my family situation, with the kids coming up to start school and my career coming towards an end. Opportunities for coaching and management are limited here and I can’t see them coming up at Inverness three or four years ahead. Caley Jags manager John Robertson will have Brad McKay free to return after suspension and will have to decide whether to restore the ex-Hearts man or keep Gary Warren as a starter alongside Coll Donaldson.